For a time each month, before your period, are you feeling not quite yourself? Perhaps your mood changes and you feel more worried and irritable? Or are your symptoms more physical, such as headaches, or feeling uncomfortable due to cramping, bloating and breast soreness? If so, Premular may be right for you. Premular is a natural medicine that’s clinically proven to relieve symptoms of premenstrual syndrome (PMS).1-3 Premular not only relieves symptoms, but can help improve menstrual cycle irregularities associated with PMS. Food for thought: Did you know that 70-90% of women may experience at least one symptom of PMS? Find out more about how Premular can help relieve premenstrual symptoms. Adults and adolescents: Take 1 tablet in the morning, preferably with food. For best results take Premular for a minimum of 3 months, or as recommended by your healthcare professional. Your health practitioner can help you decide whether Premular is right for you. It is always best to discuss all of your symptoms with your healthcare professional to determine whether Premular is a suitable option for you and how to use it. Premular is well tolerated based on clinical research and years of worldwide use. Premular is a natural medicine that has been proven to relieve the symptoms of PMS in clinical research.1-4 It contains a particular extract from the fruit of Vitex agnus-castus, called Ze 440. This specific extract Ze 440 and optimal dose has been tested in placebo-controlled clinical trials, so you can be sure that Premular has demonstrated relief of PMS symptoms. Natural medicines can vary considerably depending on the species of plant chosen, the way it’s grown and harvested, and the extraction and production process. So it’s essential to ensure the product you receive is the same as that shown in clinical studies to relieve PMS symptoms. How long should Premular be taken for? The minimum recommended period is 3 months. However, depending on the condition and symptoms, Premular may be continued long term under the recommendation and guidance of your healthcare professional. Is Premular likely to interact with any medications? There are no known reported interactions between Premular and other medications. However, if you are taking the oral contraceptive pill or other prescription medication, it is important that you talk to you healthcare professional before taking Premular. Can Premular be used during pregnancy and breastfeeding? Premular is not indicated for use during pregnancy or while breastfeeding. Although there are no reported safety concerns, there are no published studies to establish safety for the use of Premular during pregnancy or while breastfeeding. It is important to speak with a healthcare professional if you have specific questions or concerns. Is Premular suitable for children and adoloscents? 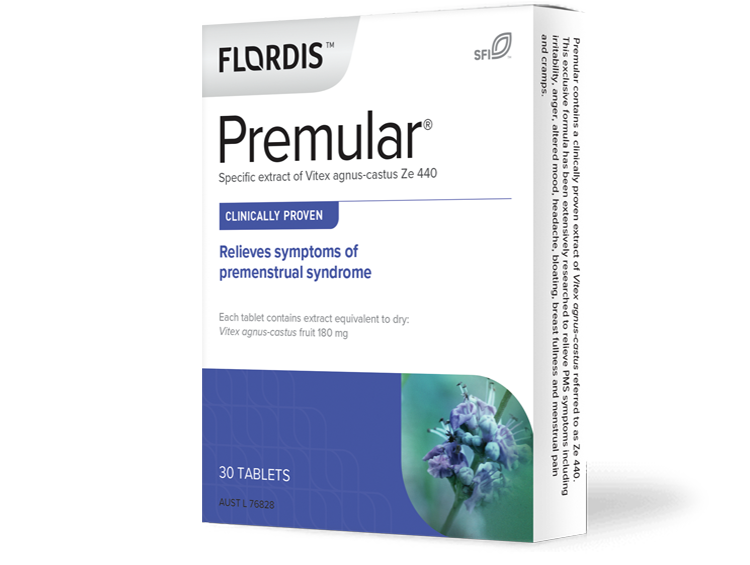 Premular is indicated for use in adults and adolescents with PMS symptoms. It is not recommended for use in children under 12 years. Should Premular be stopped before surgery? It is important to discuss this with your healthcare professional, including the anaesthetist and surgeon. Yes. Premular contains a very small amount of lactose (40 mg) in each tablet. Will Premular affect the ability to drive and operate machinery? Premular has no known adverse effects on the ability to drive and operate machinery. Where can I find Premular? Premular is available from pharmacies, selected health food stores and natural health practitioners. If you go to the Where to buy button above and follow the instructions, you will be able to find a list of practitioners and pharmacies in your area that either stock Premular or will know how to order Premular. Even if your local pharmacy is not on the list, they will be able to order it in for you. Schellenberg R, et al., Phytomedicine 2012; pii: S0944-7113(12)00280-2. Funded by Max Zeller Soehne AG.4. Eltbogen R, et al. J Gynäkol Endokrinol 2015; 25(2):10-15. Tschudin S, et al., Arch Womens Ment Health 2010;13(6):485-494. Joshi JV, et al., J Midlife Health 2010;1(1):30-34. Premular® is a registered trademark of Max Zeller Söhne AG. A Mediterranean plant whose extract is used to relieve the physical and mood-related symptoms of PMS. An exclusive extract made from the plant’s fruit is the key ingredient of Premular.